Sephora has their Beauty Insider Appreciation Event! Celebrate with up to 4x on all purchases through September 17 online and in-store! Depending on your Beauty Insider level you can get lots of beauty insider points (that you can later redeem on free rewards). 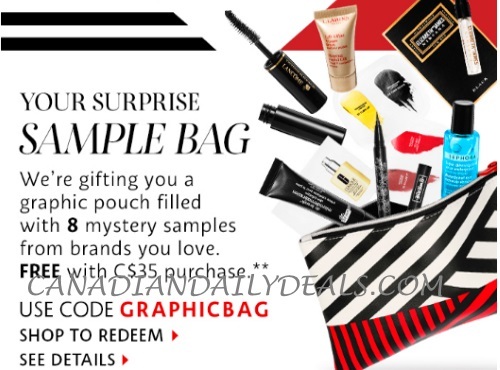 Beauty Insiders get 2x the points, VIB get 3x and VIB Rouge get 4x points! Also, get a Free Surprise Sample Bag filled with 8 mystery samples with brands you love with any $35 purchase! Enter the promo code GRAPHICBAG at checkout (samples will vary online and in-store). Elizabeth and James Nirvana Black deluxe sample (0.05 oz/ 1.47 mL). Shop the early launches of the holiday releases too now, with the Holiday First Access! Click here to brows Sephora.